I want the period filter value doesnot affect object initial value. 2. how to set the period filter display format? see 05.jpg. 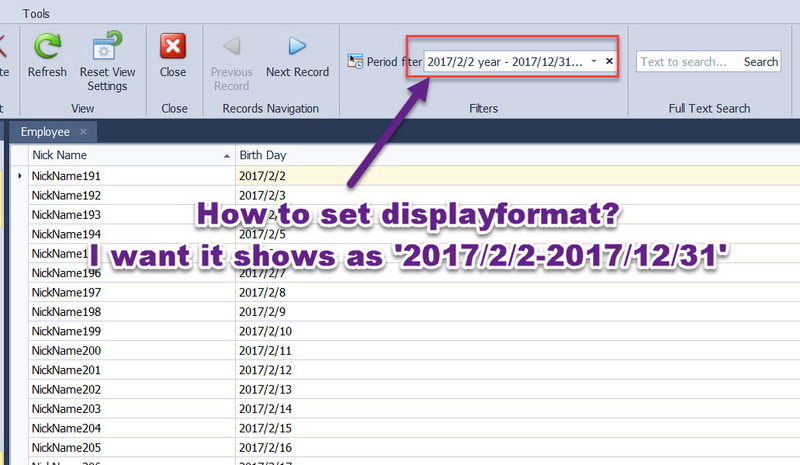 I want set the display format as '2017/2/2-2017/12/31'. attached file solution5.rar is my solution. Thanks for the provided information, nickcole. We are going to investigate it. Give us some time. - set the property UseByListViewCriteriaObjectCreating = false. >> how to set the period filter display format? a PeriodStruct sets the value (05.jpg) for a PeriodControl and the PeriodStruct uses an overridden method ToString() for this line. If you want to change the display format, you must create a custom struct and control as PeriodStruct and PeriodControl and override a methods. Do you have plan to provide the capbility for set display format for period filter? If not, can you provide a sample for set ting the display format. Base your answer, I don't know how to realize it. Unfortunately, we have not plan to provide the capability for setting a display format for period filter. To solve the issue for 'display format', you can create PeriodControl independently or to set culture for your project as zh-CN (or other).